Picture it: A family of three (Mom, dad, six-year-old boy), five large suitcases, one bed and no floor space. Chances are if you've stayed in a hotel with your family, it's not that hard to picture. The thought alone might be stirring up some pretty torturous memories. Especially, if you stayed for more than three days in the cubical called a hotel room. I've done this one time in my life, and have sworn to never, ever do it again! Thankfully, there is a new trend in the hotel industry, making it easier for families to travel, Apart'hotels. Offering more than one room with a bed and limited footprint, Apart'Hotels provide a fully equipped home away from home, with plenty of room for a family to move around. I've stayed in three, from Melbourne, Florida to Melbourne Australia. They are the real deal, super budget-friendly for family travel and offer SO MUCH MORE ROOM!!!!! While in the past, fully equipped serviced apartments were considered only for relocation and extended stays of more than a week or two, times are changing. 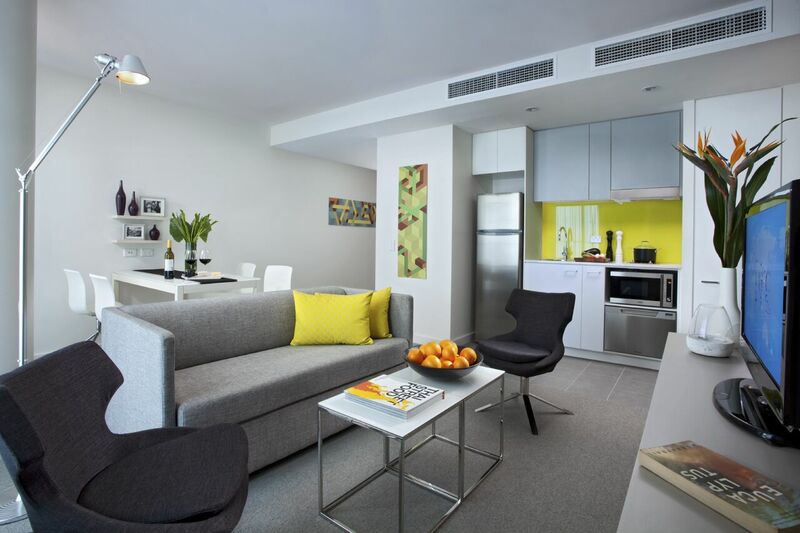 Serviced apartments or Apart'hotels are popping up in major cities across the world, and with comparable nightly rates to traditional hotel rooms, they are staking their claim on the hotel industry. Pictured above is a two bedroom serviced apartment at the Apart'Hotel Citadines on Bourke, in Melbourne Australia. The Hubs, kid and I stayed in that beautiful space our first two nights in Melbourne. Offering two bedrooms, two bathrooms, a fully equipped kitchen (with Dishwasher! ), a separate living area and workspace, we were FLOORED! 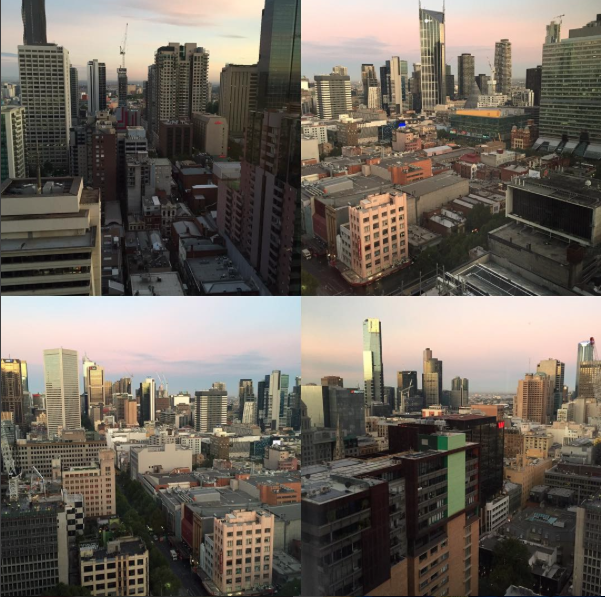 The place was huge, with beautiful views from the 25th floor, and centrally located in the Heart of Melbourne's CBD! Like, on the biggest shopping street in the city! But that's not all... The room rate was comparable to a traditional hotel room down the street! The trend towards Apart'hotel development is showing the growth of serviced apartment units to far exceeded traditional hotel unit expansion over the next two years. According to a survey conducted by the Association of Serviced Apartment Providers (ASAP), 48 serviced apartment operators show expansion targets both in the UK and globally, at an anticipated global increase in supply of 145,000 serviced apartment units through 2018. The shift towards Apart'hotels is great news for budget-friendly family travel. With the larger room foot print, fully equipped kitchen, and in-room washer and dryer facility, families can pack lighter and prepare meals in the room. This is especially helpful when traveling as a large family, or with young children. The money saved on baggage fees and eating meals out may even pay for the room. We were able to eat breakfast in the room, store left overs from meals out, keep bottle waters cold, do laundry, and be centrally located. I cannot stress it enough, before you book a traditional hotel room, look for an Apart'hotel or serviced hotel first. Your family will thank you. YOU, will thank you. Most of all, your family-budget will thank you.